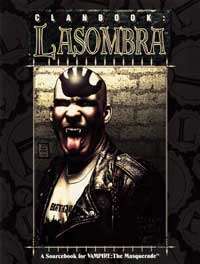 From their webs of shadows the Lasombra guide the destiny of the dread Sabbat. Unseen even by mirrors, these lords of darkness glide through the night they rule, orchestrating the rise and fall of Kindred and kine alike. From the Sahara Desert to the Spanish Main, from the monasteries of Seville to the mean streets of New York City, no other clan so embodies what it means to be a vampire. New Merits, Flaws and Obtenebration powers.